The cottage is made of 3 foot thick granite stone with a flagstone floor partly covered with rugs. It is tastefully decorated retaining its original rustic charm. At the heart of the main living area there is a wood and coal burning stove with the sofa to one side and dining table and chairs to the other. There is also a flat screen colour TV and DVD player. The kitchen is off to one side, new in 2016, with all basic equipment, full size oven, touch hob, fridge freezer, and toaster. Off the other side of the living area is the full bathroom with bath and shower hose, and heated towel rail. The two bedrooms are upstairs with views of the sea. One double and the other with bunk-beds, that can be put side-by-side if required. The windows are all double glazed, there is a storage heater and wall mounted electric radiators in each room. The garden has a paved area, raised seated area (with glorious views of the sea and sunset) and small lawn. There is a spectacular coastal path 5 minutes walk from the cottage which leads along the cliffs to sandy coves, Geevor Tin Mine (with lovely cafe and spectacular view) and Pendeen Watch Lighthouse. A wood burning stove at the cottage makes the romantic setting complete. 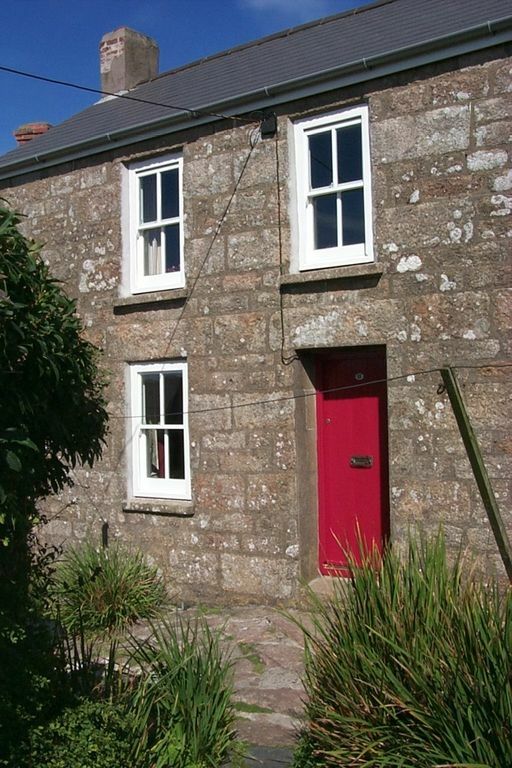 Surrounding Area: Peaceful, quiet village with a short walk to the corner shop and two pubs and post office in Pendeen. Penzance is 15 minutes drive away for shopping, trains, buses, restaurants and tennis. The Geevor Tin Mine is also a short walk away. And the Pendeen Watch Lighthouse is on the way to our closest beach, Portheras, about a 30 minute walk from the cottage or few minutes drive to park by the lighthouse and lovely walk to the beach. St. Ives and the Tate Gallery are 25 minutes drive away on a dramatic coastal road with spectacular scenery, cliffs, wild flowers and ancient standing stones. Also many birds and wild life, idyllic beaches, surfing, horse riding, fishing, sailing and trips to the Scilly Isles. The wonderful Eden Project is an easy 45 minute drive away, and many gardens including The Lost Gardens of Heligan. Also bird, seal, and butterfly Parks (brochures are in the cottage). And, of course, there is picturesque Mousehole with great restaurants, and lastly Land's End. Many wonderful restaurants in the area. : See list of restaurants available in the cottage or request from owner by email. The restaurants change over the years so I'd rather give you up to date recommendations! Many thanks for making our holiday in Cornwall memorable. Your cottage is fabulous and I will keep your email address on file for the next time we come to Cornwall. We loved everything about our holiday despite the weather the first week and the M5 shutting down and the children think it is far better than going abroad. As for the cottage it is a charming dream of a place. We are a family of three generations who live in London and all of us take turns at the cottage as there are now too many of us! It's been a very special and much loved place for us for over 38 years. Many of our friends have been to visit the cottage and several have found their own properties near us. Some have even moved permanently to Cornwall. It's a magical place! We rented the property in the summer of 1977 and immediately loved it. The owners worked at Leach Pottery in St. Ives and the cottage was filled with wonderful pots. Leach tiles still surround the kitchen sink. The Geevor tin mine was still working then and we loved all the history of the area. We loved the fact that it was a working village and not touristy when we bought it and it's still unspoilt. We like the view of the sea the most and being so near the most stunning coastal paths, coves for watching seals, basking sharks, pods of dolphin, and those amazing sunsets over the sea. We love those granite stone walls, the wood burning stove, and cosiness of the cottage. Best is walk to "our" beach, Portheras! toilet, tub, There is a shower hose in the bath. The bath has a hose for showering and washing hair. Heated towel rails and wall mounted electric heater. (Switch is outside the bathroom door). Sink, mirror, table and shelves. Electric wall mounted radiators in all rooms. Main room radiator is at owner's expense. All others and the hot water work on coin meter. £1 coins needed, about 1 coin per day, or 2 per day in winter. Stove in fireplace for duel fuel, wood or coal. Some coal provided or order wood and coal and kindling for your stay or collect at corner shop or any petrol station. Must be dry wood! Parking for about 10 cars on first serve first come basis a few meters from cottage or more further away. Can drive car down our lane to unload in front of our gate, then park. Nice, no traffic! Duel fuel stove in the fireplace which burns wood and coal. Some coal provided or collect coal or dry wood and kindling at corner shop or any petrol station. Two/three seater sofa and dining table with 4 chairs and window seat to seat 5. Fireplace with stove, television and DVD. New ceramic hob with four burners and extractor. See photos. Basics provided: salt, pepper, tea, flour, sugar, oils and vinegar. These are usually left and are replaced when out of date. All basic equipment. We've just had a full modern kitchen installed, Nov. 2016. Full oven, ceramic hob, under counter fridge/freezer, new sink, all new cupboards, with oak counters. See photos. Dining table is on one side of the sitting room and seats five using window seat. Welcome to read books at cottage and Pendeen Centre sells many for 50 pence! With table and two chairs with sea view. Small grass area and planting. Chairs for children for garden provided. Very nice tennis club in Penzance. The living area is one room used as living/dining with sofa, TV and dining table which can seat five altogether. There is a multi fuel (wood and coal) stove in the large granite stone fireplace. There are also electric wall mounted heaters in all rooms. The bathroom also has a heated towel rail and heaters. Water is heated with an immersion tank and can be switched on for constant hot water or turned off when not needed. The new fully modern kitchen is off to one side partly divided from the sitting room and has full size oven and ceramic 4 burner hob. All bed linen is provided. The beds will be made up for your arrival. Towels cost £3 each for washing. Please let us know at the time of booking if you need towels. Please ask for more details if required. There is an outdoor seating area (patio) with table and chairs in small well planted attractive walled garden with garden gate and small lawn with view of the sea and those wonderful sun sets! The cottage is decorated in a very simple and charming fashion so as not to detract from its historic character. It is very homely and well equipped and like home from home. It is only 5 minutes walk from the beautiful coastal path and is therefore ideal as a base for exploring the stunning coast line. We thoroughly enjoyed our stay and would recommend without hesitation. “a home away from home”. And best of all it’s so near the sea! I saw a whole pod of dolphin swim by “our” Portheras Cove when I walked to the beach this week! And the wild flowers are incredible right now as are the birds. Coastal 200 year old tin miner's granite stone cottage in a very quiet village on the north coast of Cornwall about 15 minutes drive from Penzance, and about 25 minutes drive to St. Ives (and Tate Gallery) along the spectacular north coast. The coastal path starts just near the cottage with wonderful breathtaking scenery. The location is very near the Pendeen Watch Lighthouse and some lovely secluded, usually empty, sandy beaches, Portheras being our special favorite. The Geevor Tin Mine and Cafe (good Sunday lunch!) is a short walk away and has fascinating tours underground and a museum. Boscaswell is a peaceful, friendly village and Pendeen a short walk away for some good basic shopping, and two nice pubs. Lovely Sennen Cove is a short drive away through the charming village of St. Just. The wonderful Eden Project is about 45 minutes drive away. Also there are many National Trust Gardens to visit including the Lost Gardens of Heligan and many activities for children in the area. Golf: Golf Courses are available.